From 1978 to 1995 the Porsche 928 was the talk of the town. The 2 door coupe body was stylish with sleek lines, and very impressive. You simply couldn’t help but get noticed. It was also their most expensive car to find its way to market. Today it remains a hot item and you can still expect to pay a pretty penny to own one. This car quickly earned the name “land shark” because of its ability to eat up the road in little time. In fact it has earned the title of being the fastest road car in the entire world. And it was a title that it definitely earned. The late 1960s saw Porsche reveal itself with a new look and feel from the earlier days. In fact there had not only been big changes to the company there had been quite a shake up in the executive too. And with shake ups come new idea. Ernst Fuhrman was one of the new executives to come on board as Managing Director. He was quick to recognize the popularity of the 911 was about to wane and he wanted to introduce a car to the market that would be not only a great sports coupe but also a luxurious sedan. The design study was initiated in 1971 and 1978 saw the first 928 come to market. This was a car that was going to have plenty of power and so the V8 5.0 L with 300 HP would become stock equipment. The first cars has four barrel carburetors but those were soon rejected for the Borsch K Jetronic fuel injection system. Although it was recognized as a real achievement surprisingly sales were initially slow. Over time it grew in popularity but nothing like predecessor models so in 1995 it was discontinued. It is always all about design and the 928 is no different. The 928 offered a water cooled V8 engine mounted in the front of the car. It was rear drive and had a displacement of 4.5 L and it offered up 219 HP for North America. This is a car that is relaxing to drive. In fact during its time it had the reputation of being the most relaxing car on the market. You could choose from the Mercedes Benz automatic transmission or the 5 speed dog leg manual transmission. Lots of luggage space and you can access it with the large hatchback. The polyurethane bumpers were integrated into the tail and nose and they are paint matched to the body. It’s classified as a 2+2 because it has 2 small seats in the rear. They may be more beneficial folded down for luggage storage but they are functional. Porsche was one of the first cars to introduce all wheel steering. Years later Japanese auto makers came on board. It’s a great feature and Porsche driver’s got to experience it earlier. In 1980 the 928S was introduced in the European market which eventually made it to North America. The 1987 model had a single disc clutch and an updated 5.0 L V8 engine. In the latter part of 1986 the 928 S4 variant debuted with a new single disc clutch and new and improved 5.0 L V8 engine that was used in both the North American and European markets. The styling updates were significant and they gave the car a much sleeker, sexier look and feel. But it also made a considerable difference to the weight of the car resulting in a substantially lighter weight overall. 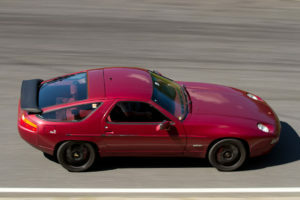 The 1987 model saw the new 928 S4 enter the market. It had a single disc clutch added and an updated 5.0 L V8 engine with an impressive 316 HP. It also has some sporty interior upgrades and a sleeker exterior. It was also considerably lighter than previous versions. The S4 stayed in production until 1991 when the 928 GT was released. This was the sportiest of the 928s to ever hit the market. In 1993 the 928 GTS entered the scene with a complete makeover with an updated interior and the larger 5.4 L 345 HP engine. A loaded GTS cost more than $100,000 USD making it the most expensive car on the market for its era. Automatic transmission and 6 speed manual were both available. This is a car that today still holds its value on the market. The 928 was certainly a car that evolved over its 18 years on the market. Some changes were subtle while others where much more bold. But no matter the changes the car underwent it maintained its reputation as a fast, fun, and sporty car to drive. When it came to performance this was a predictable car with great weight distribution and the powerful V8 kept it a real player on the track easily able to outperform many of the other Porches. Wayne Treister has been owned and ridden Porsches for 15 years. Visit his Porsche site at http://www.porschesworld.com to learn more about the different models. Part of the reason Classic Cars Online US exists is to help connect classic car buyers and sellers, and we’ve added several ways for you to connect, but first, be sure to visit the Classifieds page if you’re in the market to buy or sell classic cars such as the iconic Porsche 928.